grass stains: Goodbye, sweet companion. When we moved into our house in November of 1999, we quickly met Moses, our backdoor neighbor. 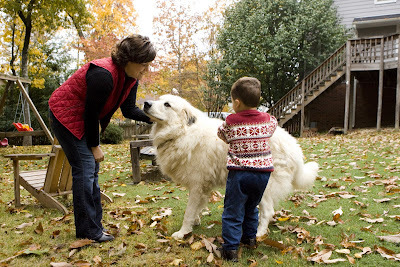 Moses was a Great Pyrenees "puppy," born in April of that year but already bigger than I was. 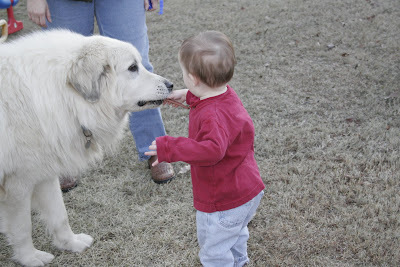 A gentle giant, Moses was just precious and loved all the attention I gave him. 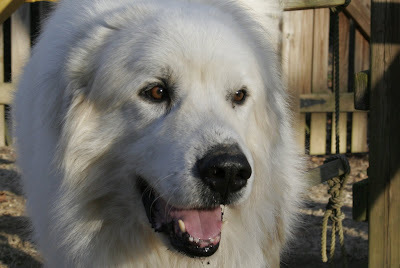 His owners both worked full-time, and their two sons were school-aged, so they weren't home much to play with him. 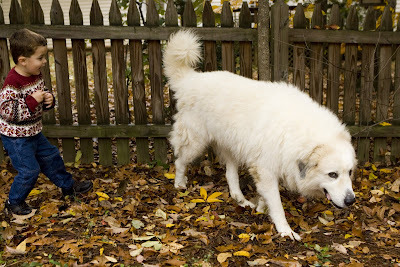 I played with him a good bit, but I worked full-time, too, and since we had a fence between our yards, we just ran along the fence together, I'd feed him treats and he'd jump up on the fence so I could pet him. About a year later, I asked my neighbors if I could put a gate in the fence so that I could have Moses over to play whenever I wanted (and he wouldn't have to jump up on it and crane his neck over so I could pet him). The fence was ours, not theirs, and they were thrilled that I had taken such an interest in Moses, so they happily agreed. From then on, I had the best of all worlds. 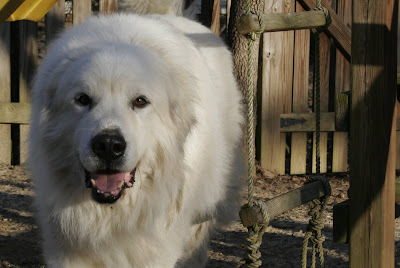 Moses came over to play every chance I had -- all 160 pounds of him! -- and we became great friends. 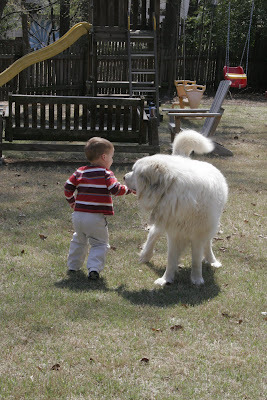 In 2002 I had Nathaniel, and he met Moses within his first week of life. 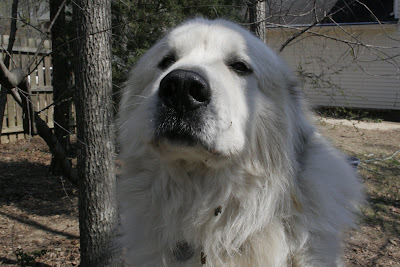 Moses was so gentle with him, just sniffing and snuffling around him, curious but not aggressive in the least. As Nathaniel grew and started to walk, Moses continued to be gentle with him ... the child who weighed only 25 pounds and chased after him with a stick didn't faze Moses in the least. Nick was born in 2004, and again Moses accepted him with open arms. It was around this time that Nathaniel started to talk, and Moses got a new name: "Mo-Mo." Five years later, that's what we still call him. 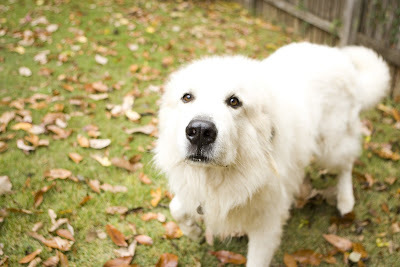 And to tell you how much time he spent with us and how little he spent "at home," one day about two years ago, his owner came out to his backyard and was petting him. We were out playing on the swings, and Nathaniel asked, "WHY IS THAT MAN PLAYING WITH OUR DOG?" 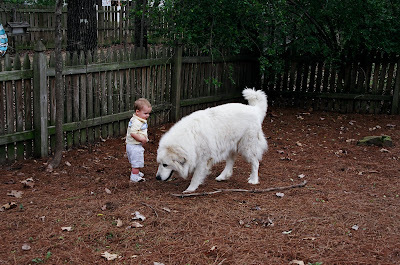 One of the greatest benefits of having Moses to play with was that he was virtually the only dog the boys had ever known (at least on an up-close-and-personal basis), so they were never scared of dogs! After all, what could be more imposing than Moses? And Moses was great! To this day, Moses has never jumped on, been rough with or knocked down ANY of our boys. That's a true testament to his sweet nature, because just slapping one of them in the face with his giant tail could have done it! And he didn't stop with just our kids. 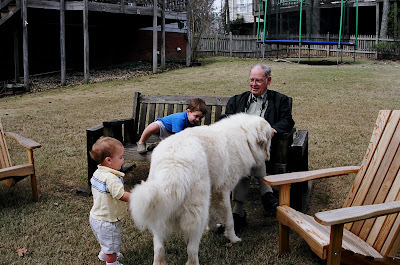 He was kind to ALL of the kids who played in our yard, even ones he'd never met before. 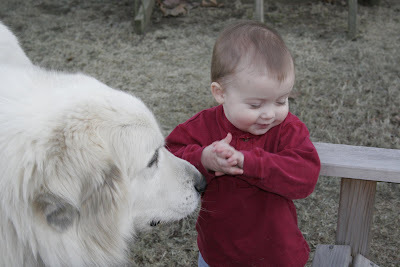 In the pictures below, you can see him gently sniffing my cousin's son Branum, and then how gently he took a treat from Branum's hand. That was always one of the things he did best ... no matter how anxious he was to have a treat, he never once nipped at anyone's hand to get it. He snuffled it out of your hand, like a horse taking a sugar cube from your palm. Whenever we've had to do projects for school that involve taking pictures of or drawing our family, Nathaniel and Nick always include Mo-Mo. When I was pregnant with Jake and we found out we were having a boy, I told Nathaniel and Nicholas we were going to have four boys in our family: Daddy, Nathaniel, Nick and the new baby boy. And Nathaniel said, "No, we're not! We'll have SIX BOYS: Daddy, me, Nick, the new baby, Scout and Mo-Mo!" Mo-Mo's owner called me last night to tell me that he passed away yesterday while we were at work; he died peacefully in his yard, one day after he greatly enjoyed The Unusual Snowfall of 2009. 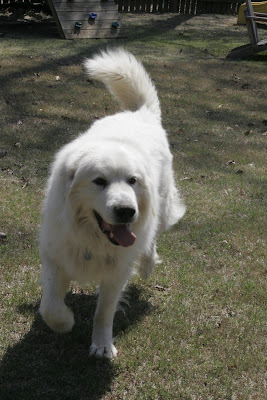 I got all choked up and am so sad that we've lost this sweet, sweet member of our family. 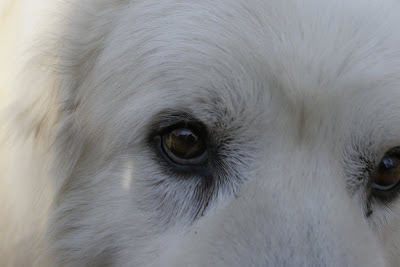 He was the one I brought leftover hamburgers home to, the one whose face appeared over the fence every time I drove into the driveway, the one whose low, loud barks I was able to hear over the baby monitor INSIDE OUR HOUSE for six years. Last night, it was too quiet. 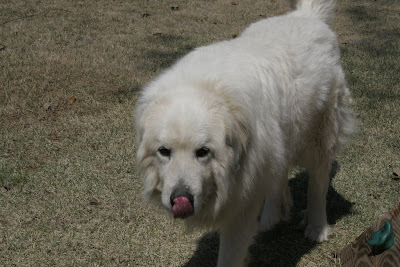 Mo-Mo, we loved you so, and we will miss you.